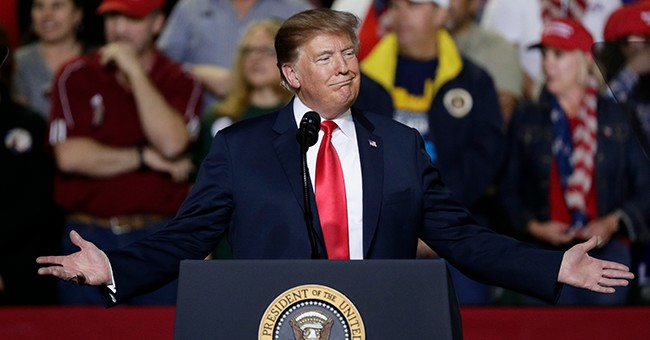 It is no secret that the conservative base has been majorly supportive of President Donald Trump with small-dollar donations since his election but after the commander-in-chief vetoed Congress' attempt to block his national emergency declaration on illegal immigration, thousands of Americans concerned with border security flexed their dedication to the President's agenda with more than $1 million in donations to the Republican National Committee this past weekend. Shortly after the veto, a fundraising email signed by Trump was sent to Republicans across the country with the subject line -- “VETO SIGNED!” Throughout the weekend, the RNC digital team followed up with subsequent texts reiterating the president's dedication to border security. Republican voters heard these messages and answered his call. How big was the response? According to some, it was one of the highest engaged email fundraising requests ever for the RNC digital team. With more than $1 million dollars entering the RNC's war chest in just over two days, the average donation from the President’s veto e-mail was $38 per person. This shows yet again that most of the President's supporters are everyday Americans who simply want a safer country. “The overwhelming response is just another example of the strong grassroots support for President Trump’s agenda and a continued desire to see the border wall finished and our border secured,” Chairwoman McDaniel exclusively told Townhall in a statement. Furthermore, when polled by the RNC this weekend, more than 93% of those contacted responded with "Yes, Veto & Finish the Wall." The cash haul and dedication to the wall should scare Democrats in 2020 for multiple reasons. The first is that the RNC has a dedicated team of digital fundraisers who will strategize the best way to use their massive amounts of cash on hand in the lead up to 2020. Democratic candidates on the hand will be spending their money attacking one another. At that rate, it is going to very difficult for the Democratic nominee to catch up to President Trump and the RNC. The second is that the GOP base is just as dedicated as ever to the RNC and the President's agenda. Illegal immigration will continue the be a key issue in the years to come. As more and more liberals turn towards open borders and amnesty, the GOP base will be as fired up as ever for 2020 and demand a wall along the southern border. To that extent, Chairman McDaniel assured Townhall the wall would indeed be built for the country. “This is a promise President Trump made to the American people and one he intends to keep. It is clear by the level of enthusiasm that the American people support him in this effort," McDaniel said in her statement. The Democratic National Committee, which already has had its fair share of fundraising woes, better start taking note or they will certainly be outmatched in both enthusiasm and spending power in the next election.